In this chapter, Munger discusses the super powers of incentives. While he believes everyone understands how important incentives are, he also believes that everyone (including himself) constantly underestimates its powers. Munger takes the reader through examples at several companies (including Fedex, Xerox, GE, and Westinghouse) where aligned (misaligned) incentives powered (impeded) the firm's effectiveness. According to Munger, the most important rule in management is "Get The Incentives Right!" An important consequence of the power of incentives is human bias caused by the very same incentives. This causes even generous and caring individuals to be able to rationalize to themselves even the most immoral and callous of behaviours. Munger's examples of this "cognitive drift" in action include a doctor murdering his patients, salesmen/brokers selling products their clients don't need, and management consultant reports that conclude with the advice "This problem needs more management consultant services." Munger suggests some antidotes against falling prey to such bias: fear advice that, if implemented, is good for the advisor, learn the basic elements of your advisors trade, and doublecheck/disbelieve much of what you're told. As powerful as incentives are, it is a puzzle to Munger that the topic is not discussed in academic textbooks devoted to psychology. Economists have long studied its powers, as incentives form the basis of many economic theories. Economists have also long used the term "agency costs" to describe a firm's costs due to the disconnect between manager and owner incentives. For example, a sales force paid only in commissions may be more efficient than a salaried sales force, but will also be more difficult to keep moral. As such, incentive systems make tradeoffs between costs and efficiency gains. Read the other misjudgments here! Open-end mutual funds offer the investor access to both liquidity and the ability to sell for net asset value. On the other hand, many funds are driven by relative performance and often grow to sizes where market-beating returns are not possible. Since managers are compensated by assets under management, they are also prone to follow short-term trends in order to avoid falling behind their peers in the near-term which could trigger a mass exodus of investors. Closed-end funds do not offer investors ready liquidity at net asset value, however, they may be prudent investments when they trade at substantial discounts to their net asset values. Under the mutual fund banner, Klarman recommends the Mutual Series Funds and the Sequoia Fund. Do they manage their own money in parallel with their clients'? Has the size of the portfolio grown exceedingly large? What is the investment philosophy of the manager? Does it make long-term sense? In evaluating investment results, investors must look deeper than a manager's historical investment returns. For example, any manager can generate phenomenal returns within a certain period of time. Are the returns described over at least one full business cycle? Also, were the returns generated using leverage, or were they generated despite the portfolio holding large amounts of cash (in which case risk is much lower)? Klarman concludes the book by recommending that investors adopt a value-oriented investment approach. If they do not have the time to manage their money full-time, he recommends finding a trustworthy manager who employs this philosophy. Without valuing a single stock, it is often possible to determine the extent to which Mr. Market is offering companies for sale at large discounts. Various signals and indicators may be used for this purpose, and we've discussed them previously including TED spreads, margin debt levels, P/E levels in the aggregate market, and what Warren Buffett calls "the best single measure of where valuations stand at any given moment": the ratio of stock market values to Gross National Product. are being offered generous valuations in the public markets. When such valuations are not so generous, private companies will tend to sit things out and wait for better conditions. 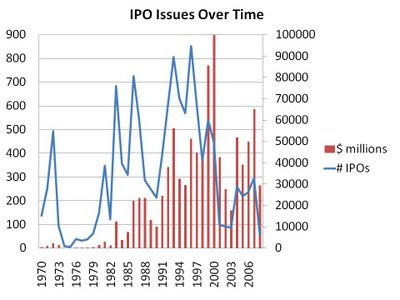 Note the drops both in the number of IPOs as well as their aggregate values during recessionary years such as 1990 and 2002. Also note that 2008 numbers are 80% lower in volume, and more than 50% lower in value than they were in 2007 (and that value number is skewed upwards in 2008 thanks to the abnormally massive Visa IPO that represents 60% of the total IPO value in 2008!). The fact that private companies are staying away from the market suggests that they are not receiving market valuations enticing enough to their present owners. Since private companies looking to IPO are often valued by comparing them across several metrics to similar public companies (e.g. Google would have been compared to Yahoo using Price/Sales, Price/Cash Flow etc. ), that suggests that public companies are also selling at a discount! For those who buy when the market is fearful and sell when the market is hot, it would appear from many of the indicators we've looked at that it is a great time to buy. By almost any valuation metric, HealthSpring (HS) appears to be undervalued. It trades with a P/E under 5, and a P/B value of .7. As a managed health care organization targetting seniors, revenues and earnings have been fairly stable over the last several years. In addition, the company has more cash than it does long term debt. For a company in such a stable industry, it is surprising to see such a conservative capital structure. Nevertheless, there is no shortage of risks to this company. Investors who rely solely on the numbers will often miss many of the risks that have the potential to derail the outstanding returns that a stock may offer. Investors who understand the risks, however, are more likely to be able to make a more accurate determination as to whether the upside potential outweighs the risks. Heath care inflation. Margins are being squeezed as revenues are not rising as fast as costs. Who knows how long this situation will persist. Government regulation. This is a major issue with most managed care companies. Complying with ever-changing standards and dealing with enforcement agencies is a cost that is hurting many competitors, and HS is not likely to be immune. Reliance on Medicare. With service rates set annually by the Centers for Medicare and Medicaid Services (CMS), HS can be caught off-guard by rate changes that are not in line with the costs. For example, 2010 CMS benchmark rates were brought down by around 5% based on the types of care HS provides. All that being said, the above risks don't neccessariliy mean the stock doesn't offer great upside potential. However, all investments should lie within a value investor's circle of competence. Those who limit their investments to this restricted subset of the stock universe should be able to achieve better returns through superior stock selection. Interested in another opinion on HealthSpring, or any other stock for that matter? One of our sponsors, MarketClub, has offered our readers a free analysis of a stock of their choosing here. Last time we looked at Office Depot (ODP), it traded as though it were on the brink of bankruptcy. Since its low 3 months ago, however, the stock is up around 500%! While its debt situation and poor operating performance make it an unlikely value candidate, we couldn't resist discussing the stock because of its upside potential. Furthermore, the company's joint venture in Mexico appeared to be worth more than the valuation the market was giving the entire company! The Mexican operation earned another $12 million of net income in the first quarter of 2009. Poor decision-making has gotten Office Depot to a point where it now has to sell assets at terrible prices. Nevertheless, further asset sales to the tune of another $200 million are anticipated (compare this to its market cap of $160 million just three months ago! ), which will increase cash flows and improve the company's liquidity position. Operationally, the company has closed more than 100 stores already this year, and another 150 or so have leases that expire in 2009, which should allow it to lower its costs even more. As we saw with Build-A-Bear, ODP may even be able to reduce its rent requirements on stores whose leases are not expiring. While Office Depot is not out of the woods yet, it certainly has the ability to stay afloat and reward those who invested at the height of the market's fear. Studies have demonstrated that companies with high standards of corporate governance outperform those with weak standards. However, individual investors can hardly be expected to be experts on corporate governance (though there are some steps they can take to mitigate this). Nevertheless, by employing a little common sense, investors can scratch off potential stocks from their buy list when things just don't smell right! As an example, let's look at Meade Instruments (MEAD), a leading maker of optical products such as telescopes and binoculars. Meade trades at a discount to its net current asset value. But that's where the appeal of this company ends. In addition to having lost money in each of the last four years, there are a number of troubling signs. Its CEO resigned in February, which by itself may not be a significant factor, except for the fact that the CFO resigned just one month later. Two more directors have also recently resigned, pushing the company into non-compliance territory with the Nasdaq exchange, as the company now no longer has three independent directors on its audit committee. It's entirely possible that Meade could turn itself around and offer current investors excellent returns. But the director/management turnover, financial reporting, and covenant violations suggest shareholders would also be advised not to swing at this particular pitch. This chapter is about trading and portfolio management from a value investing point of view. Portfolio management is described as an on-going process that is never complete. While certain businesses may be fairly stable, its prices will fluctuate over time, and so the investor must constantly monitor the situation. Value investors are not into buying certain industries or business ideas without regard to price, and so price changes are a fundamental factor that drive portfolio decisions. Klarman also points out the need for portfolios to be somewhat liquid. Investors are advised not to purchase their entire positions at one go, but rather to leave room to buy in at cheaper prices should the stock go down. A good test for an investor is to consider whether he would indeed buy more of the stock were it to drop; if he is not, he is probably speculating and should not be buying in the first place! The decision of when to sell a stock is also discussed. Determining when to buy a stock is usually a much easier decision for a value investor, since the stock at that time is trading below what the investor considers an adequate margin of safety. But when the stock is trading within the range of values the investor believes it to be worth, what is the investor to do? Klarman argues against selling after percentage gain thresholds or price targets have been reached. Instead, the investor should compare the investment to available alternative investments: it would be foolish to sell if there were no better investments and the stock was still undervalued, but it would be foolish not to sell if there are better bargains around! This chapter describes some of the risks and opportunities associated with investing in distressed securities. While regular value investing involves dealing with a wide number of unknowns, distressed securities represent particularly complex situations. Because most investors are unwilling to put in the time and effort involved with analyzing such securities, Klarman believes the opportunities are plentiful in this realm. There are three reasons a company might run into financial distress: operating issues, legal issues, and/or financial issues. Issuers can respond to such situations in one of three ways: continue to pay obligations, attempt to convert obligations into less stringent obligations (e.g. get debt holders to accept preferred stock), or default and declare bankruptcy. Investors must understand the implications to their investments as the above scenarios play out. Investors must also understand how other stakeholders will react to such situations, and understand the power that various stakeholders have (for example, one third of a stakeholder groups constitutes a blocking group, and can use this to further that stakeholder group's interests). Klarman argues that while bankruptcies are often complex and difficult to analyze, investors who know what they are doing usually have tremendous opportunities for returns with very little risk. At the same time, someone who doesn't know what he's doing risks losing his entire investment. The process of analyzing financially distressed securities starts at the balance sheet. Assets should be valued so that the size of the pie can be estimated. Obligations should then be subtracted from this amount. This task is much more difficult than it appears, however. For a distressed company, asset values are usually a moving target, and getting a handle on their value can be difficult. Furthermore, off-balance sheet liabilities must also be considered. Finally, Klarman takes the reader through two bankruptcy examples where mispricings occurred which allowed the enterprising value investors the opportunity for excellent returns. Just two months ago, Sierra Wireless (SWIR), a provider of wireless solutions, was trading at a large discount to its net current asset value. With cash of $270 million, A/R of $67 million, and inventory of $33 million, the company's current assets covered its total liabilities and still leftover some $280 million. Meanwhile the company's market value was only around $90 million. Unfortunately, this enticing investment opportunity was still not enticing enough, considering the company's economics. Sierra Wireless operates in a dynamic and fast-changing field. For most investors, this field is outside their circle of competence. As such, it is very difficult to predict this company's earnings going forward. Revenues were down around 25% in the latest quarter, but at the same time they have more than quintupled in the last four years. Only investors who understand how the company's products or processes are superior can have confidence in the persistence of this company's earnings. In addition, the value of the inventory can change dramatically in this industry, as obsolescence can quickly render high-tech equipment valueless. Furthermore, while the company listed a cash balance of $270 million, $190 million of it is restricted. The company was in the process of acquiring Wavecom with that money. Again, only an investor who can make sense of this industry can determine whether this is a good use of cash. Investors who didn't read the fine print would have been surprised to notice most of the cash balance disappear in return for equity in a company they know nothing about! While investors who buy a diversified group of companies trading at discounts to their net current asset values will likely do very well, those who take the time to evaluate each company on its own merits can likely do better! Avoiding situations outside an investors circle of competence, and performing due diligence on a company's assets can help an investor achieve this endeavour. Lexmark (LXK), a manufacturer and supplier of printers, has seen its revenue decrease for the last four years, as stronger competition has forced it to reduce prices and exit now unprofitable product lines. While a string of revenue reductions of this nature may send most investors to the exit, value investors recognize that the business may still have some value, and thus prefer to first compare a company's price with its value before determining a course of action. Lexmark trades with a market cap of $1.3 billion, despite the fact that it has around $800 million of cash on its balance sheet. A healthy dose of cost-cutting in the first quarter of 2009 resulted in operating income of $75 million off of a sales decline of 20%. With its strong cash position and its P/E of just 7.5 in this depressed earnings environment, Lexmark would appear to have value potential on the surface. But as we discussed earlier this year, companies with defined benefit pension plans will be negatively affected by the stock market's drop. Prudent investors who read the notes to the financial statements will see that Lexmark is indeed suffering from this phenomenon: pension plan assets fell last year from $714 million to $469 million, against an estimated pension obligation of $734 million. This represents a shortfall of $265 million, a cash outflow which will eventually have to be borne by shareholders (barring a miraculous stock market recovery, which of course is never safe to assume). When Lexmark's pension shortfall is combined with its debt obligation of $650 million, its value potential is no longer as certain. While it might still be a buy, investors who don't consider all of this company's obligations are likely to overvalue its intrinsic value. Are public companies too focused on short-term results? "...anticipate continued pressure on the gross margin rate for 2009 as a result of mark-downs." "...the customer is extraordinarily price-sensitive. We are reducing AURs [average unit retail prices] in all the brands..."
It would appear Abercrombie is willing to throw in the towel, as the recession has taken a toll on results. Despite the discouraging results, however, the $27 million loss represents only a fraction of the $463 million of cash on hand the company is currently carrying. So what's prompting the apparent 180 degree change in strategy? "...the pressure to please the [Wall] Street is intense. Every quarter, the question on analysts' minds is whether the company will meet or beat expectations in the market...the negative, of course, is that short-term results become more important than the long term goals every company must pursue in order to build shareholder value." Analogous to this phenomenon is the short-term mentalities of institutional investors, as described by esteemed value investor Seth Klarman. Is this mentality currently taking hold at Abercrombie & Fitch? It's hard to say for sure. Investors would be wise to understand the ramifications (i.e. this should fall within an investor's circle of competence) before making a bet on this company. When quarterly earnings reports are released, investors tend to focus on the headline numbers. Were earnings 12 cents per share or 11? What does this mean for next quarter's earnings? For long-term investors, the discussions that follow these questions are essentially useless. Long-term investors want to know how the business is doing, and must therefore train themselves to ignore what may be important to speculators. Consider Canam (CAM), an industrial manufacturer involved in large-scale construction projects. The headlines read that earnings in the most recent quarter fell by 30% year over year, suggesting the company is being battered by the recession. A closer look at its income statement reveals a very different story: sales are up 11%, and operating earnings are up about 10% over last year. The earnings shortfall is mainly due to a non-recurring tax difference between this year and last year, and after-tax losses (compared to after-tax gains last year) of a company in which Canam has an interest. Another important note missed by the headline number: order backlog is down about 10% from this time last year. While the current backlog of $280 million still represents about 1.5 quarters worth of sales, investors should keep an eye on this number going forward to avoid negative surprises. Traders and speculators base their decisions on the headline numbers. Value investors must dig deeper to find out what the business is worth. For a more detailed discussion of Canam as an investment opportunity, see this article. Though stock in Canam has risen more than 40% since we first discussed Canam as an undervalued investment, it still appears to offer long-term value. Disclosure: Author has a long position in shares of CAM. This chapter examines opportunities at the time of writing that value investors had in the banking sector. In the mid-1980s to early 1990s, many banks were selling for less than book value. During the recession of the early 90s, many thrifts had to be bailed out by the government due to some of the high-risk loans they had offered and due to the general downturn in the US real-estate market...remind you of today? Apart from the top 10 to 20 largest banks, Wall Street analysts did not follow thrifts. As a result, small and mid-sized shops were trading at inefficient prices, allowing value investors to purchase some companies at a large discount. Klarman walks the reader through some elements of valuing banks. He considers many banks "unanalyzable", for example if they deal in junk-bonds or complex mortgage securities or other exotic lending instruments. Conservatism is of the utmost importance when valuing companies in this industry, due to the fact that they are highly leveraged and thus already contain a certain amount of risk. Klarman argues that book value is a good start for valuing a bank, but is usually a conservative estimate of what it is worth. Book value should be adjusted upward for understated assets such as appreciated investment securities, below-market leases, real estate carried below cost and a stable customer/deposit base. Investors must also be on the lookout for items that should be used to adjust book value downward, such as intangible assets, bad loans and poor investments that are carried at cost. Klarman also notes that there are no sure things in this industry. Asset quality, management discretion, and interest rate volatility play large roles in determining whether an investment will have a good outcome. All investors can do is pick low-risk individual banks with the best prices to their fundamentals and hope for the best. Klarman concludes by taking the reader through the example of Jamaica Savings Bank, by demonstrating the discount to which it traded to its intrinsic value and the resulting profit astute investors accrued. This chapter contains of a plethora of value investing examples. Klarman details a number of securities where investors who paid attention to fundamentals (e.g. strong businesses masked by unprofitable divisions, or companies trading at discounts to cash etc.) reaped enormous profits. Klarman believes that investors should look for potential catalysts when making investment decisions. Catalysts are events that cause a stock's value to be recognized, thus resulting in immediate returns to investors who purchased at a discount. A liquidation is an example of a catalyst, and examples are given where such events have returned generous - and quick - positive results for investors (e.g. during bankruptcy events, where securities generally trade at a discount to their recoverable values). Share buybacks and asset sales also represent partial catalysts, as they can cause a stock to inch closer to its underlying value. More importantly to Klarman, such events signal that management is interested in returning value to shareholders, which bodes well for the future. Some areas where Klarman believes value investors can indeed find value include: liquidations, complex securities (i.e. securities institutions can't purchase because they don't fit set categories), rights offerings (often offering prices lower than current market value), spinoffs (as they are usually sold by holders of the parents, thus depressing prices immediately) and risk arbitrage (depending on the market's mood, as sometimes the market's exuberance can erode returns). LCA Vision (LCAV) is a provider of laser vision corrective surgeries. Demand for these non-essential, expensive surgeries is strongly correlated to levels of consumer confidence. As one can imagine, this correlation has resulted in the number of surgeries performed this year to be slashed in half as compared to last year. Combined with the fact that the company's cost structure is fairly rigid (medical/laser equipment, service locations and staff still have to be present even if not used to capacity! ), and the prospects for this company look grim. This business model would make most investors head for the exits at economic times like these. For investors who look to buy businesses rather than stocks, however, this company still has some value. And it is precisely because most investors headed for the exits that value investors were able to buy into this company for far less than it is worth. When we last looked at LCAV, it traded with a market cap of $64 million, despite the fact that it had $56 million in cash alone! When looked at from the point of view of a buyer of an entire business (as value investors like to do), one was essentially paying $8 million to purchase a business that had earned an average of $15 million in net income the last four years. Yes, it had lost $7 million in the last quarter, but management was closing unprofitable locations, reducing capital expenditures, and is believed to have cut expenses such that the company's cash flow would break even in 2009. Since the stock's low just two months ago, the stock is up some 200%! Investors who avoided the herd mentality, and instead focused on buying businesses selling for below their worth, were handsomely rewarded. North American Galvanizing and Coatings (NGA) provides rust protection for metals for commercial and industrial customers. It trades with a P/E of just 8, despite the fact that it has no debt and just booked record earnings in the first quarter of 2009. Its revenue has nearly doubled in the last three years, from $47 million to $86 million, despite the recession. So why is this yet another of the many investments not worth a swing? The answer has to do with the company's cost structure, which is heavily reliant on the price of zinc. Compared to other commodities, the price of zinc is especially volatile, having fluctuated by at least 90% in each of the last three years! Value investors prefer to avoid companies which are reliant on commodity prices, as their cash flows are very difficult to predict. Some may argue that since NGA is both a buyer and seller of zinc, it can pass on price increases to its customers. Unfortunately, this argument ignores the fact that substitutes do exist. The primary substitute for zinc that is used for protection from rust is paint. Indeed, a quick look at NGA's operating history suggests that customers are quite willing to switch between the two: there is a clear pattern of volume declines when zinc prices increase, and vice versa. While an investor could luck out by having zinc prices (and therefore the company's costs) hold steady or trend favourably in relation to substitutes, this is hardly the modus operandi for a value investor, who prefers to only take risks when the odds are firmly in his favour. Newell Rubbermaid (NWL) is a familiar stock on this site. Back in August of 2008, we thought it was still a bit too pricey at $19/share. But starting in December of 2008, it began to look attractive, having reached $9/share. A couple of months later, it became a downright steal, at under $5/share. Last week, however, the stock rose 20% in one day, as the company reported its first quarter results for 2009. At its current price of $11/share, does it still represent good long-term value? While not nearly the compelling buy it was at $5/share, NWL still appears to offer investors the opportunity to buy in at a discount. Operating cash flow for this year is expected to come in around $400 million, while the company trades for just $3 billion. Management expects earnings of between $1 and $1.25 per share, giving it a forward P/E under 10. Considering the fact that earnings are depressed thanks to the recession, this may represent good value. The company has cut $100 million of its annual costs to cope with this recession (compare this with its operating income of $150 million for all of 2008), and has already identified further cuts that will be made if the recession continues to deepen. At this level, NWL may still offer compelling long-term value. Disclosure: Author has a long position in NWL. For value investors, a drop in the price level of the stock market does not necessarily mean the value of these businesses has changed. But there are exceptions. Companies that have certain types of pension plans will be in trouble, as we discussed two months ago; thanks to the drop in the stock market, these firms will now have a shortfall between the funds they control and what they owe their employees. But just because a company you are considering doesn't have this type of pension plan does not make it immune to changes in the price level of the market. Consider Service Corp (SCI), provider of funeral services. The nature of SCI's business is such that many customers prepay for their funeral requirements, thereby taking the burden off of their families. Because this money is not yet earned, it is classified on the balance sheet as "deferred revenue" (similar to how a football team receives cash upfront for a game that has not yet been played, or a home builder gets a down payment for a house not yet built). To maximize returns, SCI invests part of this money in the market. Unfortunately, much of this money has been lost. The company has unrealized losses of over $600 million in these accounts! With SCI having a market cap of just $1.2 billion, this is not an insignificant amount. We've discussed before how deferred revenue can be a useful gauge in determining what a company's future earnings will look like. Investors who don't consider how that deferred revenue is invested can end up way off in their valuations! Investors will often gauge a business' ability to make money by looking at its operating income over a period of several years. But investors who ignore the line items on the income statement which fall below operating income can miss out on some crucial details. Consider JAKKS Pacific (JAKK), maker of toys and related products for children and pets. Since net income can fluctuate due to one-time tax benefits and changes in capital structure, operating income can be used to get a better feel for what the assets of a company can generate in the way of profit. JAKK trades for $380 million, while averaging about $80 million in operating income over the last four years. After taking a normal tax rate into account (recall that operating income is before tax), it would have a P/E of around 8. The company also has a net cash position (i.e. negative debt) and working capital of over $300 million, which make its price seem even more attractive. But the most impressive part of the company's valuation has not yet been taken into account, because it doesn't form part of the company's operating income. JAKK has a video game joint venture with THQ, which earns JAKK approximately $20 milllion per year (up from $7 million five years ago). Placing an arbitrary P/E of 10 on the relevant portion of the venture puts its value to JAKK at $200 million, almost half of JAKK's market cap! Meanwhile, the venture is only carried on the balance sheet at around $60 million, and therefore may be overlooked. However, prudent investors be warned. This joint venture is subject to an important lawsuit, and the profit sharing agreement between JAKK and THQ is up for renegotiation. Investors can read all about it in the company's notes to the financial statements. In this case, we saw how income from a joint venture can make a company worth more than its operating income suggests. Previously, we saw how looking at operating income is inadequate for a company that has been structured to pay almost zero tax! Sometimes, there are so many value investments available that the only constraint on the investor is a lack of funds. Most times, however, Klarman finds it difficult to find value investment opportunities. Investors can spend a lot of time reading through financial reports, research reports, and other financial news and end up finding nothing but fairly valued opportunities. Therefore, it is important that the investor look in the right places. A few of the places Klarman suggests finding investment opportunities include the new-low lists and the largest percentage-decliners lists which are published by major news sources. Klarman also finds that companies whose dividends have been cut or eliminated can also be unduly punished by the market, leaving investment opportunities. Of course, just because a stock shows up on one of these lists does not make it a buy; one still has to go through the valuation process described in previous chapters in order to determine whether it trades at a discount to its fair value. Klarman also encourages investors to look at what management is doing with respect to the company's stock. Nobody knows the business as well as management does, and so if management is buying that is often a good sign for the stock. Investors are also encouraged to consider why a stock has been performing poorly (and therefore may make for a good investment). If an investor can pinpoint this reason, he can be more comfortable that he may have found value. If this reason cannot be found, it is possible that the investor is missing some information which the market knows (important lawsuit pending, competitor coming out with similar product etc.). Business value cannot be precisely determined, Klarman asserts. Not only do a number of assumptions go into a business valuation, but relevant macro and micro economic factors are constantly changing, making a precise valuation impossible. Although anyone with a calculator or a spreadsheet can calculate a net present value of future cash flows, the precise values calculated are only as accurate as the underlying assumptions. The essential point is that security analysis does not seek to determine exactly what is the intrinsic value of a given security. It needs only to establish that the value is adequate—e.g., to pro­tect a bond or to justify a stock purchase—or else that the value is considerably higher or considerably lower than the market price. For such purposes an indefinite and approximate measure of the intrinsic value may be sufficient. Klarman discusses what he believes to be the only three ways to value a business. The first method involves finding the net present value by discounting future cash flows. Problems with this method involve trying to predict future cash flows, and determining a discount rate. Klarman argues that investors should err on the side of conservatism in making assumptions for use in net present value calculations, and even then a margin of safety should be applied. The second method is Private Market Value. This is a multiples approach (e.g. P/E, EV/Sales) based on what business people have paid to acquire whole companies of a similar nature. The problems with this method are that comparables assume businesses are all equal, which they are not. Furthermore, exuberance can cause business people to make silly decisions. Therefore, basing your price on a price based on irrationality can lead to disaster. Klarman believes this to be the least useful of the three valuation methods he names. Finally, Klarman discusses liquidation value as a method of valuation. A distinction must be made between a company undergoing a fire sale (i.e. it needs to liquidate immediately to pay debts) and one that can liquidate over time. Fixed assets can be difficult to value, as some thought must be given to how customized the assets are (e.g. downtown real-estate is easily sold, mining equipment may not be). When should each method be employed? Klarman argues that they can all be used simultaneously to triangulate towards a value. In some cases, however, one might place more confidence in one method over the others. For example, liquidation value would be more useful for a company with losses that trades below book value, while net present value is more useful for a company with stable cash flows. Klarman takes the reader through a valuation of Esco, a defense contractor. Using the methods of valuation described in the chapter, he demonstrates that Esco was trading at a severe discount, and subsequently showed that the stock price more than doubled soon after. Finally, Klarman ends with a discussion of the failures of relying on a company's earnings per share (too easily massaged), book value (not necessarily relevant to today's value) and dividend yield (incentives of management to make yields appear attractive at the expense of the company's future). For value investors, a great company does not necessarily equal a great investment. Why? Because the price of that investment must be compared to its value. Such is the case for Hammond Power Solutions (HPS.A), a manufacturer of transformers and magnetics. We saw that in 2004 HPS appeared to trade at a large discount before it promptly appreciated; it appears to have done so again. When we discussed this company back in December, it traded at just $6/share and therefore appeared to trade with a large margin of safety. While the company has continued to perform well, the margin of safety has been almost erased, thanks to a 60% run-up in the share price over the last 4 months. In the company's recently reported first quarter results for 2009, sales continued their ascent, having risen 14% from the same period one year ago. However, there are some signs that the economy is finally catching up with this company. Hammond Power's backlog (an important measure we considered when evaluating the state of Canam (CAM)) is down 20% from last year, as orders aren't being replaced as quickly as they are being filled. Excess output capacity in the industry is also pressuring prices downward, suggesting tough times may be ahead. While the company's ROA and ROE continue to impress, today's share price reflects much of the value in this company. While many may argue that the company's growth prospects position the stock to do well in the future, value investors prefer to avoid paying for such assumptions. With the market in the state it's currently in, there is great value to be found (i.e. stocks with margins of safety) and therefore hanging on to stocks that now appear to approach fair value doesn't appear to constitute sound judgement. Value investors must constantly monitor their positions on the chance that Mr. Market is offering a fair price for a company purchased at a large discount. These Companies Are Buying WHAT? Skechers (SKX), maker of men's and women's shoes, recently purchased a used car for $120,000. Natural gas producer Chesapeake Energy (CHK), just bought a historical map collection for $12.1 million. These purchases appear completely unrelated to the respective operations of these companies, but they do have one thing in common: these items were purchased from each company's executives! Since these transactions are taking place at fair market value, these don't form part of executive pay (which can be found easily by following these instructions). Instead, they are just executive perks that most shareholders won't ever know about. But these items are disclosed in proxy statements, and Michelle Leder of footnoted.org is determined to expose them. Her site is dedicated to reporting the items that companies try to bury in their routine SEC filings. Reading Michelle's site can make a shareholder (executive) depressed (excited)! Post after post reveals many an instance of shareholders getting ripped off without their knowledge. For example, Raytheon (RTN) paid moving expenses of $229,000 for its CEO. As if that weren't enough, it paid this same CEO $500,000 because that's how much his house price dropped since he bought it...why on earth should shareholders be paying for a home buyer's mistake? While one could argue that the best executives earn far more for shareholders than they cost, that's beside the point. What it costs to retain an executive should be part of his salary; it should not be buried in fine print. Until this is the case, we unfortunately have to spend hours on end digging through SEC disclosures, and we can take advantage of the fact that Michelle is doing some of the work for us! Many value investors are extolling the virtues of Rocky Mountain Chocolate Factory (RMCF), and with good reason. The stock has a P/E of 8, while the company has almost no debt and has managed to stay profitable throughout this downturn. As noted at Wide Moat Investing, the company has also not been shy to return money to shareholders, with a dividend yield above 7%. But there is one risk that investors would be wise to note: we just don't know that much about this company's financials. It's not that the company isn't disclosing required information, but the inherent structure of the firm makes it very difficult for investors to determine how well (or how badly!) things are actually going. Ninety-five percent of the company's revenue comes from sales to its franchisees, and the results of these independent entrepreneurs are not consolidated in RMCF's financial statements - but the health of these franchisees does have a direct bearing on the value of RMCF. If franchisees are hemorraging money, the sales (and profits) currently enjoyed by RMCF will come to an abrupt halt. While we don't have any direct data as to the health of the franchisees, we can take get some clues based on what RMCF has disclosed. Franchisee purchases from RMCF declined by 24% in the last quarter (y/y), meaning franchisee sales have probably declined by a similar amount. If their cost structures are fairly rigid, chances are many of them are losing money. Indeed, since this time last year, 11 domestic stores or kiosks have closed down. However, even though the number of franchisees is down, and the existing franchisees are purchasing significantly less product, RMCF is actually carrying more inventory now than it did at this point last year. These facts don't necessarily mean that RMCF is not a buy, however, it is very difficult to tell how independent franchisees are faring in this environment. Their sales are clearly down, but do they have the financial strength to stick it out and keep buying product from RMCF, or will more of them start to drop off, propogating their difficulties to RMCF? The answer is too difficult for this investor to determine. LoJack Stock Flat...Or Is It? LoJack (LOJN) stock trades today at exactly the same level it did two months ago. But in the last two months, it has experienced some wild gyrations, having traded almost 25% below its current price, and over 50% above its current price. Has the intrinsic value of this business really fluctuated so much since March 1st? Highly unlikely. (Note that we saw similar behaviour over the course of the life of Best Buy (BBY)). Instead, what we are seeing is a highly uncertain auto market. With Chrysler filing for bankruptcy, GM's status up in the air, and weak auto sales in the first quarter (US sales were down 38% year over year), LoJack experienced a 40% revenue decline when it reported quarterly results last week. The stock price declined by over 30%! Does it offer investors value at this level? It would appear so. The company has a market cap of $60 million, but carries a cash balance of $56 million! While it does have debt of $30 million, it has ample liquidity to cover this debt and then some. As we've discussed with this company in a previous post, LoJack has a flexible cost structure (gross margin for the quarter was relatively flat despite the large drop in revenue). Furthermore, management has targeted $15 million in cost cuts in 2009 as compared to last year, and none of those savings occurred in the first quarter. While nobody knows how long the slump in auto sales will last, LoJack has the ability to bring its costs in line with its revenue and a strong balance sheet, which means it can outlast a downturn. At current levels, it may offer investors little in the way of downside while offering strong upside potential if and when auto sales return. Disclosure: Author owns a long position in shares of LOJN. In this retail environment, where consumers selectively scour for bargains, it is tempting for retailers to reduce prices in order to drive sales and reduce inventory. One company bucking this trend is Abercrombie & Fitch (ANF), whose stated number one priority through this downturn is to "protect the brands". By holding prices steady while competitors discount, management hopes Ambercrombie emerges from the recession as a superior brand that consumers are willing to pay a premium for. Is this a good strategy? Only time will tell. In a sense, however, it is a riskier strategy, as short-term earnings are sacrificed in exchange for a future benefit of uncertain magnitude. Same-store sales are down a staggering 30% year over year, as consumer preferences have shifted towards cheaper brands. Despite the large sales drop, inventories are running some 15% above what they were at this time last year, which is undoubtedly contributing to the fact that the company has had to increase its debt load from $43 million one year ago to its current level of $157 million. But the company appears poised to be able to weather the economic storm. ANF is still profitable despite the huge drop in sales thanks to its massive gross margins: buying apparel items manufactured in Asia and South America and selling them in North America for many times their cost has proven very fruitful for many companies which appeal to the fashion-conscious, and that's not likely to change. There are risks to be aware of, however. If the recession deepens, ANF's cost structure could prove inflexible. While we have seen that even healthy retailers have been able to renegotiate their leases lower, the sheer magnitude of ANF's future lease obligations ($2.8 billion, larger than the company's market cap!) cannot be ignored. Nevertheless, the company does have room to reduce prices and increase short-term profits should this happen. In previous chapters it was mentioned that most institutional investors use a top-down approach to investing. That is, they try to forecast macroeconomic conditions, and then select investments based on that forecast. Klarman argues that this method of investing is far too prone to error, and doesn't allow for a margin of safety. For example, a top-down investor must be correct about the big picture, draw the correct conclusions from that big picture prediction, correctly apply those conclusions to attractive areas of investment, correctly specify specific securities, and finally, beat other investors to the punch who have made the same predictions. In addition to these challenges, top-down investors are buying based on concepts, themes and trends. As such, there is no value element to their purchase decisions, and therefore they cannot buy with a margin of safety. On the other hand, bottom-up investors can apply a margin of safety and face a limited number of questions, e.g. what is the business worth, what is the downside etc. Institutional investors are judged based on their performance relative to their peers or the market. Thus, if an investment opportunity appears undervalued but the value may not be recovered in the near-term, such investors may shun such an opportunity. Absolute investors don't judge themselves based on their performance to the market, which results in a short-term investing horizon. Instead, they focus on investments that are undervalued, and are willing to wait for that value to come uncovered. In the financial industry, returns are expected to correlate with risk. That is, you cannot generate higher returns without taking more risk. Moreover, downside risk and upside potential are considered to have the same probability (an implication of using beta, a measure of a stock's volatility versus the market). Value investors think of risk very differently. Downside risk and upside potential are not necessarily the same, and value investors seek to exploit this key difference by buying stocks with strong upsides and limited downsides. This chapter is dedicated to describing the philosophy of value investing and why it works. The terms used to describe value investing don't require any accounting or finance background, making this an easy read for beginners looking to learn about value investing. "When you build a bridge, you insist it can carry 30,000 pounds, but you only drive 10,000-pound trucks across it. And that same principle works in investing." A long-term-oriented value investor is a batter in a game where no balls or strikes are called, allowing dozens, even hundreds, of pitches to go by, including many at which other batters would swing. Value investors have infinite patience and are willing to wait until they are thrown a pitch they can handle—an undervalued investment opportunity. As a result, Klarman asserts that value investors do not buy businesses they do not understand, nor ones that they find risky. For example, they will avoid technology companies and commercial banks. Value investors will also invest where their securities are backed by tangible assets, to protect them from downside risk. Because the future is unknown (e.g. a business worth $1 today might be worth 75 cents or $1.25 tomorrow), there is little to be gained by paying $1 for this business. The margin of safety (buying at a discount) is therefore of utmost importance. Since institutions do not buy with a margin of safety, remain fully invested at all times, and trade stocks like pieces of paper with little regard to the underlying asset values, value investors gain an advantage. 6:00 am - Buffett's $5 alarm clock purchased in 1963 finally gives out, causing him to sleep in. 7:19 am - Maria Bartiromo calls and asks if Warren's got a date yet for that "Bill and Melinda Gates Foundation thingamabob coming up in a few weeks". Coincidentally, Maria has just bought a new outfit and is looking for an occasion on which to wear it. 7:46 am - Buffett fields calls from 8 different reporters asking about Buffett's recent purchase of 3 companies. Buffett has never heard of the companies and politely declines comment, slamming the phone down after each call and cursing, "Lou! What the bejesus are you up to now?" 8:23 am - Buffett strides into work in a good mood thanks to the extra sleep and promptly offers his secretary a raise. His secretary hesitates, since she already has a higher salary than he does. 8:35 am - Buffett retrieves his messages and finds 18 messages from President Obama pleading for help with the economy. 8:36 am - Buffett places a call to GEICO looking for a better insurance rate on the private jet. 10:13 am - Maria Bartiromo calls again "just to say hi and see how things are going". 10:57 am - Buffett shuts down his computer in disgust. Another quick loss to user Challengr! 2:15 pm - Buffett strolls over to Nebraska Furniture Mart, and sneaks downstairs to where the beds are for his afternoon nap. Buffett congratulates himself for reducing depreciation charges on his own bed by not sleeping at home. 3:47 pm - On the way back from Nebraska Furniture Mart, the bus Buffett is riding breaks down and he is forced to wait 20 minutes while the operator attempts repairs. 3:49 pm - Buffett identifies a stock from his ValueLine book that's trading at a discount to intrinsic value. 3:50 pm - Buffett borrows a cellphone from a fellow passenger and places a call to Charlie to purchase the stock. 4:42 pm - Buffett walks to the corner store for the fifth time today to purchase a Cherry Coke. The man running the store politely offers to deliver a few cases to Berkshire headquarters for a nominal delivery charge, to which Buffett politely declines. Other customers hear Buffett mutter "Ain't no margin of safety in delivery expenses" on his way out. 6:48 pm - Buffett fields a call from the GEICO cavemen asking for new tennis rackets and shoes. Buffett politely explains the rackets are not meant for hunting, to which Caveman #1 replies "Oh, so you're one of them too I see!" before slamming down the phone. 7:14 pm - Buffett notices a tear in his suit and makes a mental note to stop by Walmart tomorrow for a new one. Since this suit only lasted 16 years, 8 months and 23 days, Buffett thinks to himself "They just don't make 'em like they used to." 9:00 pm - Buffett hits the sack, satisfied that today he has made $300 for himself and $30 million for Berkshire Hathaway. We hope you enjoyed "A Day In The Life Of Warren Buffett". For the real Warren Buffett story, you may want to read the only biography of his that he has endorsed, The Snowball: Warren Buffett and the Business of Life .